Published 3 May 2010 by Temporary Culture. First publication of an original short story by Ellen Kushner. Original frontispiece illustration and decorations by Thomas Canty. 6 x 9 inches, 32 pp. First issue, 21 copies hand bound in iridescent sooty red Japanese cloth with Ann Muir marbled endsheets, signed by the author and with the frontispiece signed by the artist. Fully subscribed before publication. Trade issue, 400 copies, paper covers. ISBN 0-9764660-6-6 ; ISBN 13 978-0-9764660-6-2 SOLD OUT. The story is available online at : http://www.tor.com/2010/12/01/the-man-with-the-knives/. A superb and dramatic story that concludes the events begun in her acclaimed novel, Swordspoint, A Melodrama of Manners (1987). Ellen Kushner is the author of Swordspoint , The Fall of the Kings (with Delia Sherman), The Privilege of the Sword (2006), and numerous other works, and the longtime host of public radio’s Sound & Spirit . Thomas Canty is a brilliant and acclaimed fantasy illustrator, a two-time winner of the World Fantasy Award. His art has been associated with Ellen Kushner’s work since 1987, when his striking cover launched the original U.S. publication of Swordspoint by the then-unknown author. 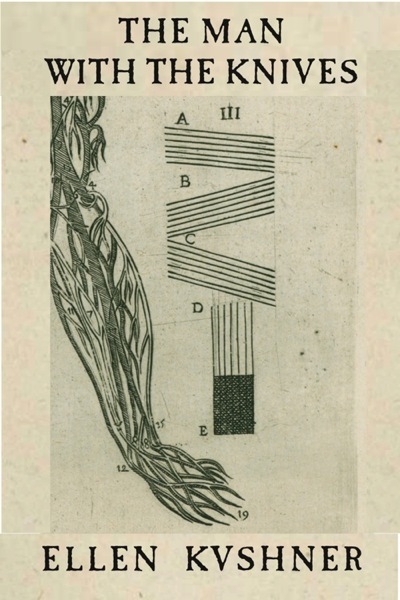 The cover design (above left) includes a detail of an anatomical plate from the 1579 Plantin Valverde-Vesalius.